When it comes to choosing from menus in restaurants I have various approaches. Sometimes I simply have a yen for comfort food and need a pizza hit or to bite into a proper, beefy burger. At other times I want my tastebuds to be surprised and seduced by adventurous cuisine. Then there are those occasions where there’s something odd on the menu which just has to be tried. My default setting when in a restaurant near the coast or beside a lake is to skip to the fish and seafood part of the menu. Living in the Canary Islands means the selection I have to eenie meenie my way through can be pretty comprehensive. Every decent supermarket in the islands has a fish counter featuring an army of goodies from the surrounding water and on every Canary Island there are excellent fish and seafood restaurants serving the catches of the day, prepared simply and deliciously. Over the years I’ve learnt to tell samas from sargos and chipirones from chopitos. 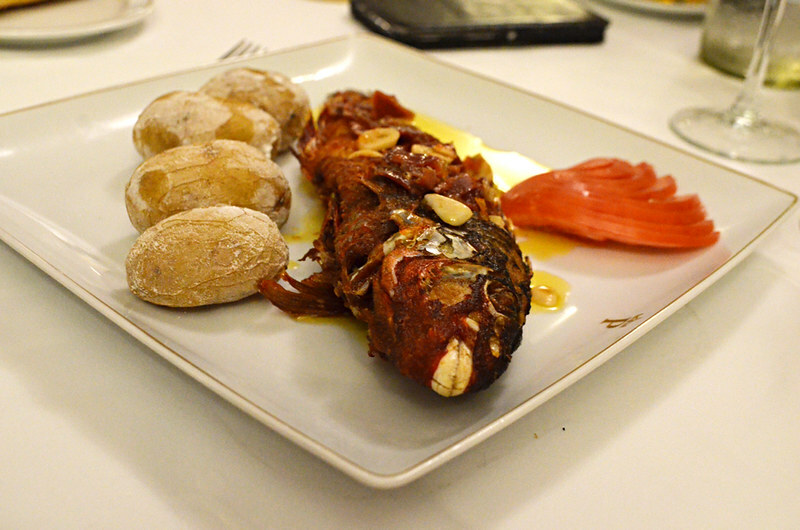 This is my choice of ten of the best fish and seafood dishes to cast a net over when visiting the Canary Islands. The number one fish to try is vieja (parrotfish). The first time I had vieja in a restaurant beside the harbour in Puerto de la Cruz on Tenerife it leapt, salmon-like, to the top of my favourite fish list (recently it’s been overtaken by turbot). It is an exquisite tasting fish. The last time I ‘mmm’d’ my way through a vieja was in the Parador on El Hierro where its flavour was enhanced even further by the addition of almonds and crispy ibérico strips. 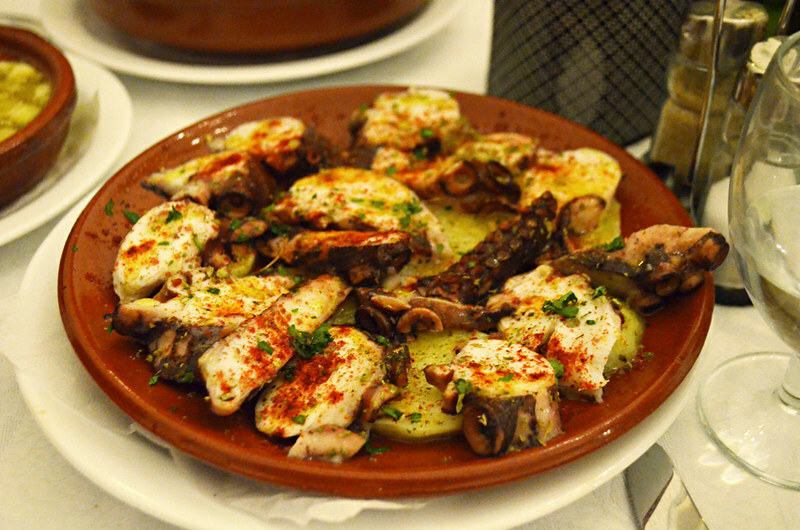 Over a decade ago we were talked into trying chipirones, tender little squid, by a very funny Canarian waiter who swore he was a friend of Tom Jones. In fact, he generally just swore a lot as he tended a table of old men playing dominoes loudly. The bar was boisterous and the chipirones melt-in-the-mouth tender, tasting quite different to their bigger calamari counterparts. 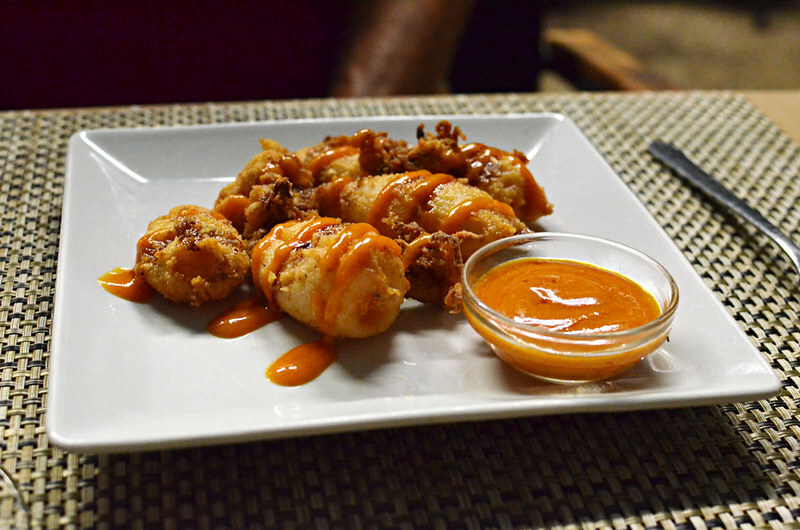 The bar is no more, but thankfully similar chipirones turn up on plenty of Canarian menus. We call this the fish for people who don’t like bony fish. 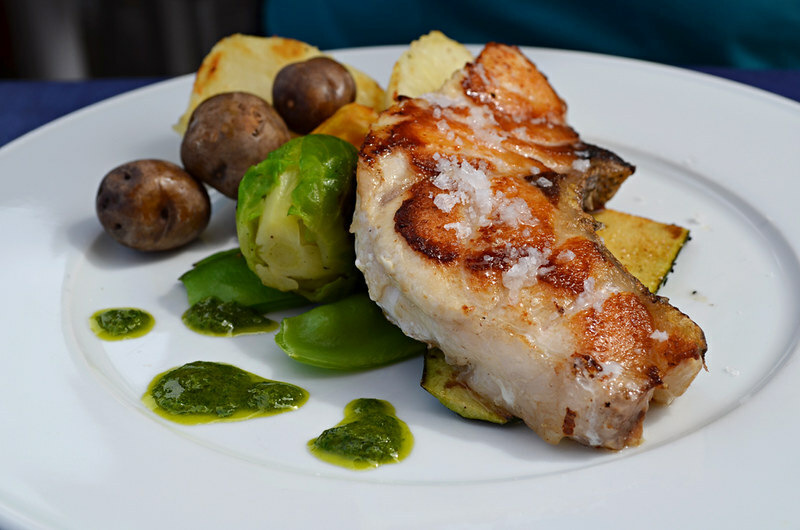 It’s a meaty, bone-free white fish. 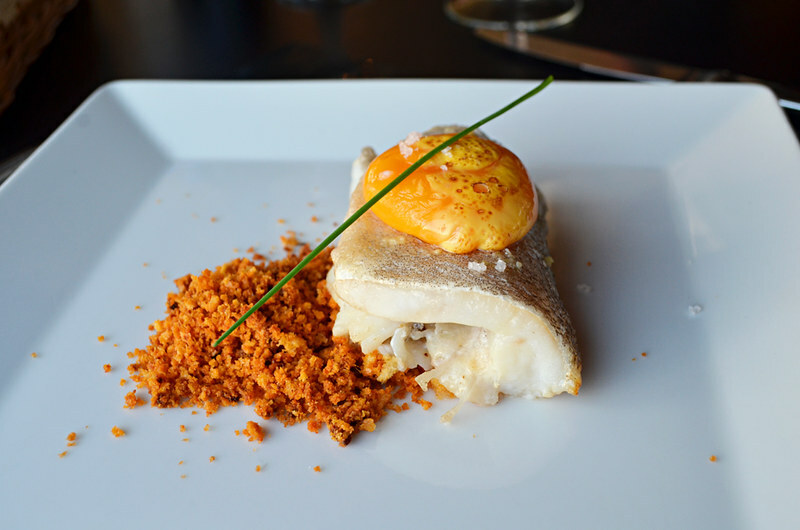 Anyone who likes cod should like cherne, especially when served with Canarian salsas mojo rojo and mojo verde. 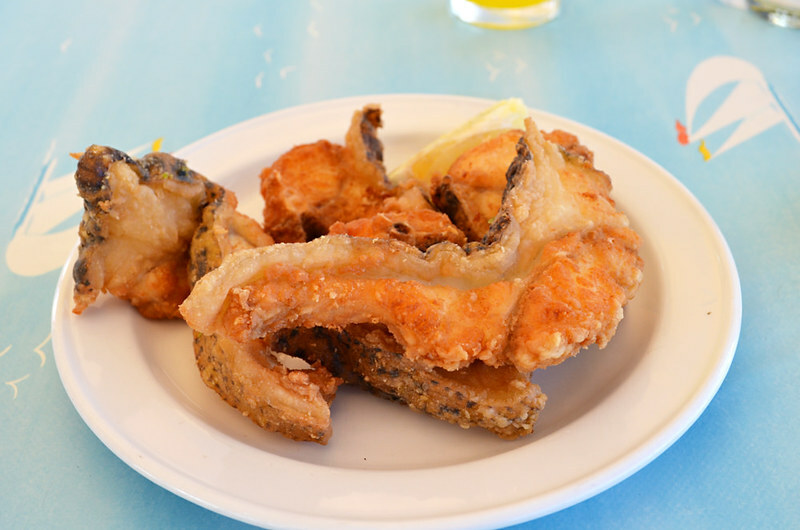 Cherne is one of the most popular of Canarian fishes so available just about anywhere with fish on the menu. Lapas are a good choice for people who like to photograph their food, as well as tasting good, they pack a punch. 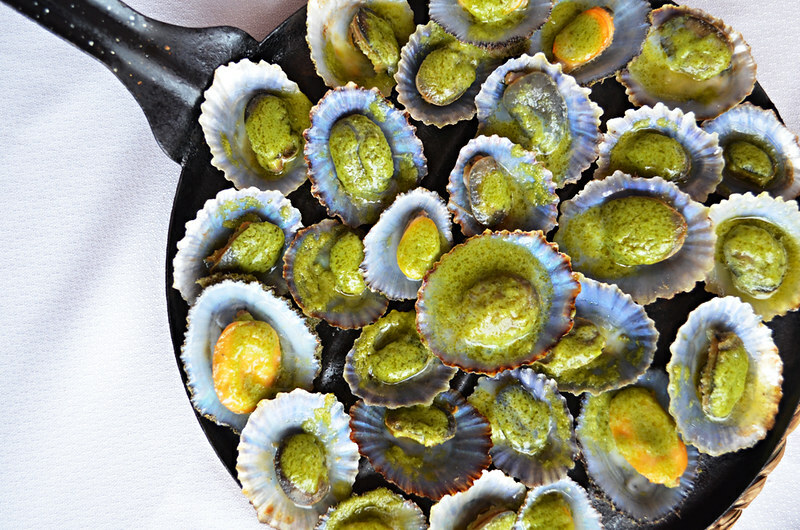 Lapas are limpets flavoured by a mix of white wine, garlic, olive oil and either parsley or cilantro which are served in a shallow skillet, which is partly what makes them so photogenic. Properly cooked they are tender and bursting with flavour. The downside is that if not properly cooked they can be on the chewy side. 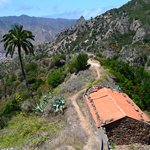 Many years ago we were taught how to eat sardines without getting a mouthful of bones by a waiter in a restaurant beside one of those picture-postcard Greek harbours. 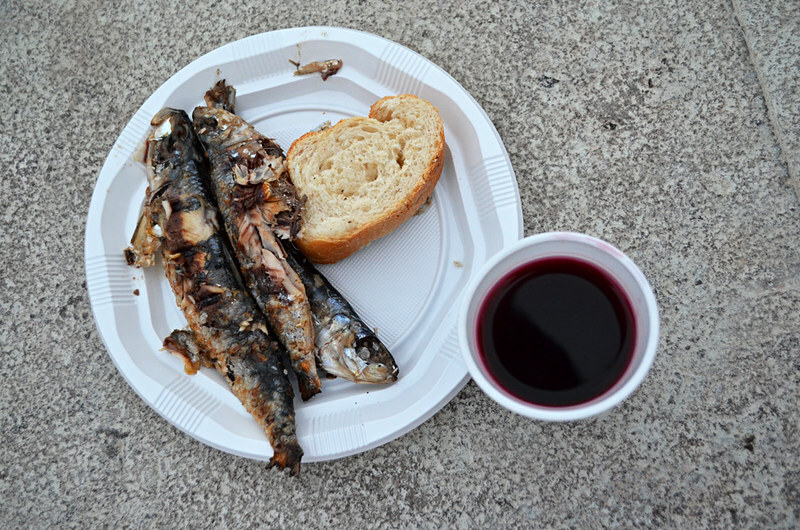 I’d avoided sardines until that point so the flavour of their delicate flesh was a complete revelation. 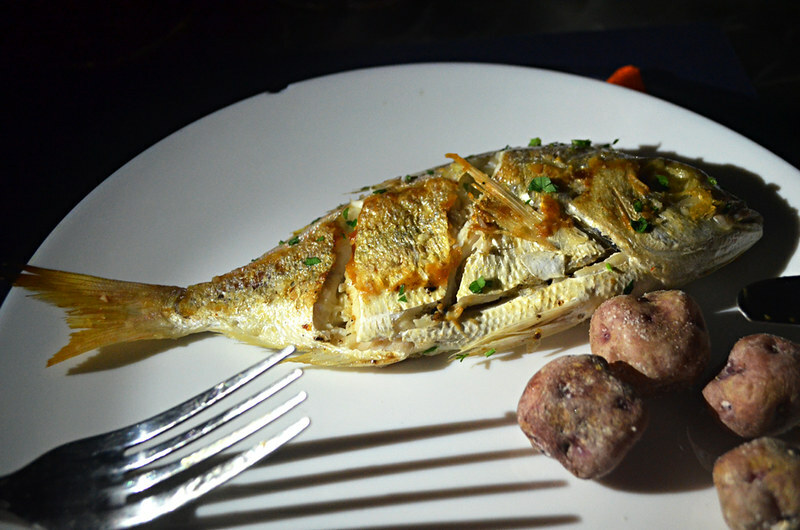 The most enjoyable way to eat them in the Canaries is at fiestas where they’re grilled on a barbecue and served with a chunk of aniseed bread and a cup of robust vino del pais (country wine). As a big fan of octopus I’m spoilt for choice in the Canary Islands. Pulpo comes chopped in salads, sliced thinly as carpaccio, served whole or just one thick tentacle. Often it turns up on menus as pulpo a la Gallega. 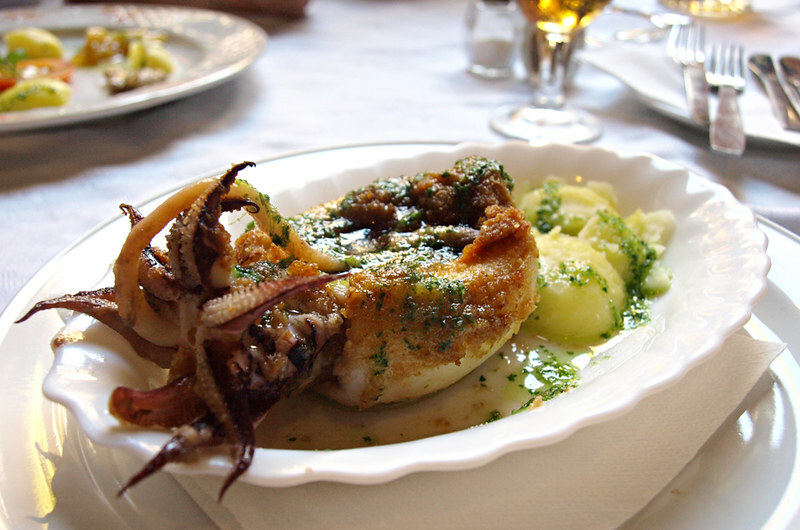 In one restaurant on Tenerife their take on ‘a la Gallega’ involves pairing octopus with mash potatoes; a match made in culinary heaven. The best pulpo we’ve eaten was in a Galician restaurant on La Palma where it was so perfectly cooked you could cut it with a fork. Bacalao encebollado (cod in onion sauce) is a popular Canarian fish dish that is found on menus far away from the coast as the cod used is generally of the salted variety. Although I like salted fish in some dishes, Jamaican ackee and saltfish springs to mind, bacalao encebollado isn’t one of my favourite local dishes. However, for those who want to try traditional specialities salt cod in one form or another should be ticked off the list. 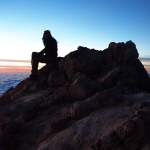 Choco is common and cheap and probably not going to be up everyone’s street. It looks alien-esque as it sits there on the plate, tentacles hanging out of a slightly charred pod. It generally does require a bit of jaw work, but I like its taste and texture. Like squid it doesn’t have a strong flavour, so matching it with Canarian mojos perks it up. Moray eel isn’t available everywhere, but there are some coastal areas where it is a speciality. It took me a while to getting around to trying morena as a waiter talked me out of it when I first tried to order it, warning it had too many bones. 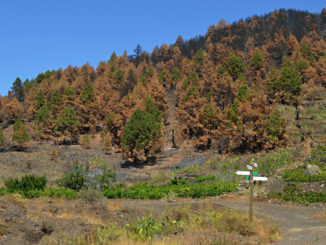 When I eventually tried morena in Puerto de las Nieves on Gran Canaria there wasn’t a bone to be found. It was like a juicy, fish flavoured pork chop. I loved it. 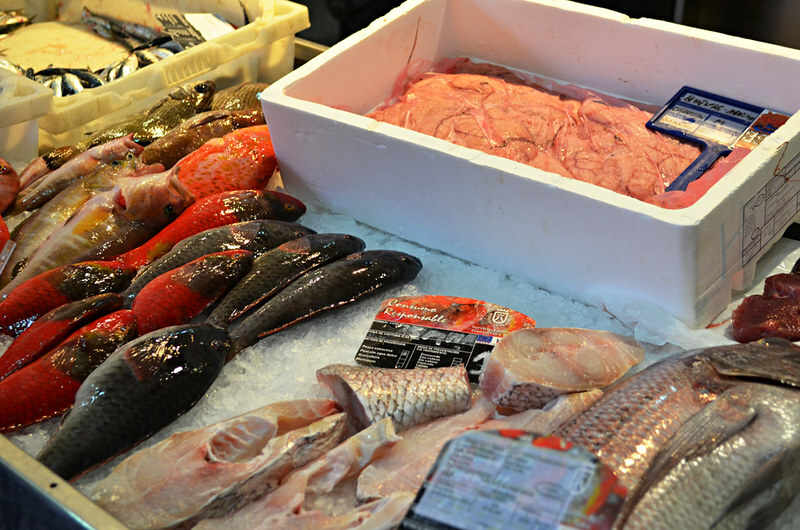 The most common fish on icy shelves in Canarian markets is bream. The exotic names stuck into the frozen white carpet may be very different from fish to fish, but a high percentage will be some sort of bream; I’ve figured out at least six different types and sometimes names change from island to island just to complicate things. Fish parrilladas (platters of grilled fish) invariably feature a couple of varieties of bream so they’re a good way to be able to compare and contrast the subtle difference in flavour between pargos and sargos as well as other tasty locals. 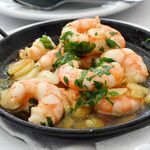 This is only a handful of the sort of marine marvels you can find on menus in the Canary Islands. As everyone knows, there are plenty more fish in that sea.